If you're looking for a beautiful, large heating unit that gives warmth to your home and is easy to install, you'll enjoy the Dimplex Galveston Electric Wall Mount Fireplace for years to come. 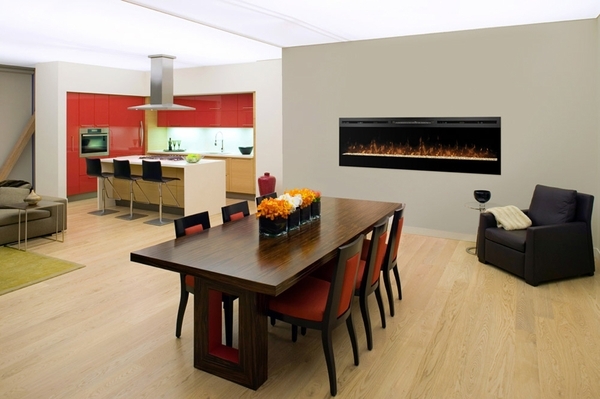 Measuring 74 inches wide and over 19 inches tall, this electric fireplace can be mounted on a wall in your home or inserted into a wall recess. Customers love the simulated fire (without the fumes, smoke, or mess) that floats over a bed of glass embers. The fan-powered heat unit has three settings, which you can adjust using the remote control. The brown wood frame unit will shrink your heating costs while providing beauty and warmth to your home. Is there a decorative faceplate available for this model? No, unfortunately this model does not offer a decorative faceplate or surround option. Does this have to be inserted into the wall for it to be flush? Also where does the heat blow from? Yes, this electric fireplace must be recessed into the wall for a flush installation. The heat would be circulated into the room above the viewing area.